Following the early April announcement of a special Los Angeles concert to celebrate the 30th anniversary of THE CULT‘s smash hit album ‘Sonic Temple’, the band announces extensive touring to mark the occasion, as well. The current incarnation of the band, led by singer Ian Astbury and guitarist Billy Duffy, will embark on select dates in North America and the U.K. starting May 2nd in Houston, Texas. The setlist for the tour will draw from the 10 studio albums released by THE CULT, with the centerpiece being a super set performance of core tracks from the band’s fourth album ‘Sonic Temple’, released in 1989. Some of these songs have not been played live since the time of the release and the subsequent touring that supported it. When originally released via Beggar’s Banquet/Sire Records three decades ago, ‘Sonic Temple’ was quickly embraced by music fans and exploded in popularity. The record garnered THE CULT their highest chart position in the U.S. at that time, peaking at #10 on the Billboard 200 charts, without question propelled by several hit singles. Those songs, accompanied in most cases by official videos, included “Sun King“, “Sweet Soul Sister“, “Edie (Ciao Baby)“, and the incendiary fan favorite, “Fire Woman“. With the songs playing hourly on radio stations everywhere, their videos receiving regular rotation airplay on MTV, and high profile tours – like the direct support to Metallica on their “..And Justice For All” U.S. trek – “Sonic Temple” became a place of rock worship. The album marked the first time THE CULT worked with producer Bob Rock (Metallica, Mötley Crüe, The Offspring), while Mike Fraser (AC/DC, Aerosmith) engineered and mixed it. It became the last album recorded with longtime bassist Jamie Stewart, who left in 1990, while Astbury, Duffy, and Stewart were joined on the recording by drummer Mickey Curry. Initially, Eric Singer (KISS, Badlands, Black Sabbath) demoed the songs in their early stages, followed by another round of demos with drummer Chris Taylor during pre-production in 1988. Keyboards on the album were contributed by John Webster (Stonebolt, Red Rider) and Iggy Pop provides backing vocals to the song “New York City“. Prior to the tour launch, THE CULT announced a special show where the Los Angeles Greek Theater will become “A Sonic Temple” on June 15th, when a diverse bill of multiple acts – Prayers, Zola Jesus, and Vowws – perform to support headliners THE CULT. Information and details about the forthcoming reissue of THE CULT‘s ‘Sonic Temple’ album from Beggars Banquet Records will arrive soon. 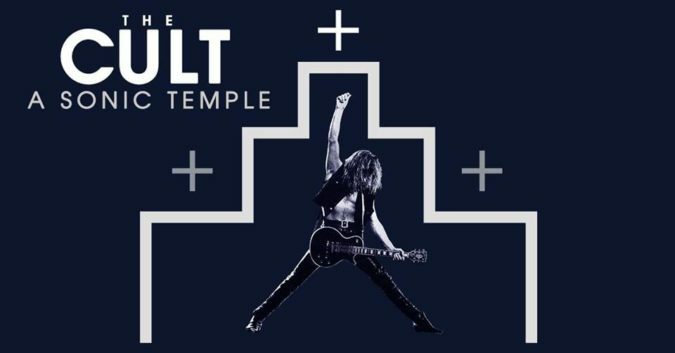 Tickets to THE CULT‘s “A Sonic Temple” Tour are on sale now, with the band expecting to announce a further block of dates for 2019 / 2020. Purchase tickets HERE. 2019, 30th Anniversary, Album Art, Beggar's Banquet, Billy Duffy, Festival, Hard Rock, Ian Astbury, Jamie Stewart, John Webster, Mickey Curry, North America, The Cult, Tour Dates, U.K., U.S.